For over 10 years, TNC has provided financial educational sponsorships for students in the HOH, HOHO, and HI programs throughout their primary and secondary schooling. Now, TNC has decided to assist these students further with their pursuit of a continued education to enable them to become active and contributing members of their community. In order to sustain the significant early work in supporting educational opportunities for primary through secondary grades, we have developed the Sister Rut Scholarship Program. 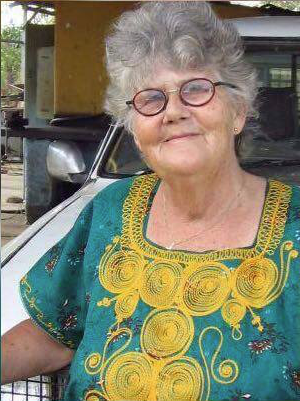 Sister Rut Lindgren was a missionary nurse from Finland who lived in Nyadire for more than 35 years. Through her years of ministry Sister Rut oversaw the expanded program on immunization for the hospital, driving out to surrounding villages each day to provide immunizations and clinic-based care in hard-to-reach areas. She would visit 24 villages on a weekly basis. Sister Rut had a deep love for the least of God’s children, being an orphan herself. Rut adopted and raised many Zimbabwean children during her time in Nyadire. She has been quoted to say: "Every child needs to be held,” and she continued to live accordingly. In 1999 the life project of Sister Rut, the “Home of Hope” Orphanage was opened in Nyadire. Money for building the orphanage was raised in Finland, who continues with cooperation with The Nyadire Connection (TNC). At the time of her death she was caring for six children who lived with her. Care for these children is, of course, an immediate concern. Today many children are enjoying the fruits of Sister Rut’s ministry as are numerous people who have been affected by her love and care. Sister Rut’s dedication to serve generously continues to be an inspiration to members of The Nyadire Connection and Zimbabwe community. TNC members, blessed with her friendship, describe her as having an “unwavering commitment," “a spirit of love and service," and being a woman with “true courage”. TNC honors this program in memory of Sister Rut’s legacy as we continue to support Nyadire and many of our students through a tertiary education.